The highest concentration of naturally occurring Citric Acid is found in lemons & limes, but also present in other citrus & strawberries. It is described as a weak organic acid and is a natural preservative found in living cells, both animal and plant. Apparently, up to 100 years ago bulk supplies of Citric Acid were still being produced from natural sources. Nowadays it is near impossible to find a natural supply in commercial quantities. We spent months searching the globe for a supplier and found none! Natural has been replaced with man-made, and has been for many decades. So, with no other option we too had to settle for a man-made Citric Acid. Of course, we ensured we sourced the very best available, one which is Food Grade and USP & BP Grade, so you can be sure you are buying the very best! 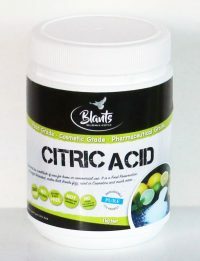 Food Enhancer & Preservative – Citric Acid enhances flavour and preserves foods. 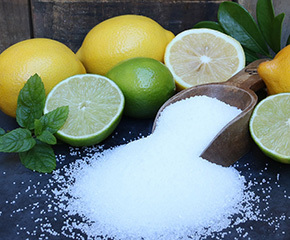 Citric Acid is used in some beverages, conserves, jelly, frozen and canned foods. Citric Acid also breaks down proteins found in meats, and makes meat tender – great for marination. Bath bombs – Bath bombs are a fun way to mineralise your body. A bath bomb would not be a Bath bomb without Citric Acid. The three main ingredients of Bath Bombs are Citric Acid, Sodium Bicarbonate and Epsom Salt. When this combination is blended and added to hot water, the carbon dioxide in the Bicarb Soda reacts with the Citric Acid resulting in a wonderful bubbling, fizzing, effervescent sensation as you soak. Cosmetic formulations – Citric Acid is often present in hair care products as an anti-dandruff agent in shampoos. Citric Acid can be found in commercial facial cream and lotions where it acts as an antioxidant, revitalising skin and balancing pH. Rich in Vitamin C, a powerful antioxidant, it enhances the production of collagen potentially restoring both skin firmness and elasticity. It is also a proven skin exfoliator, removing dead skin cells. Improved Cleaning – If you live in an area with hard water, then detergents cannot soap & sud properly. The minerals in hard water (usually calcium and magnesium) prevent detergent from soaping up and sudsing properly. 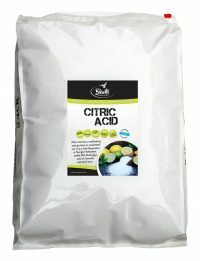 Citric Acid binds those minerals, resulting in water which is now soft, allowing detergents to do their job. Often when the water is soft less detergent is needed. As a clothes softener – If you usually use a water softener, or are in an area with hard water due to mineralisation (high in calcium and magnesium), then Citric Acid can be added to the laundry rinse in place of a commercial water softener. The amount will vary from situation to situation. If you are in an area with hard water more will be needed. Also more is needed for larger washes. A bit of experimentation is needed. Possibly start with adding a tablespoon and see how that goes and increase if need be. Bathroom & Kitchen – Citric Acid is very effective when it comes to cleaning bathrooms. A solution of 10 parts water to 1 part Citric Acid to clean and disinfect the bathroom vanity, basin, shower recess and toilet. Less dilution for difficult areas. 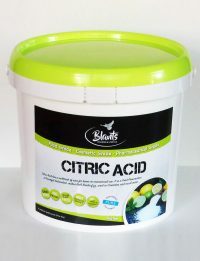 If you have a very grotty toilet add a cup of Citric Acid to the toilet, let it sit over-night, give it a brush in the morning and be amazed at the result. To clean and disinfect kitchen benchtops, cupboards, and stove tops, use a similar solution of 10:1 as with bathrooms. If need be, reduce the dilution for difficult areas. Windows – to clean dirty windows blend a tablespoon of Citric Acid with a litre of water. Pour into a spray bottle, spray, wipe and hey presto! As a de-scaler – Use to remove mineral scale from washing machines, dishwashers, shower heads, even coffee makers. To descale the washing machine add a couple of scoops to hot water, no clothes, and run a full cycle. With the dishwasher, add it to your detergent and be amazed at the sparkle and shine of dishes and cutlery. 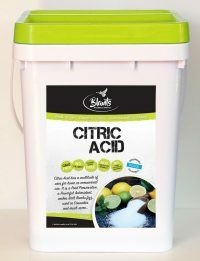 Bulk Citric Acid at wholesale prices for business owners is also available – please contact us.